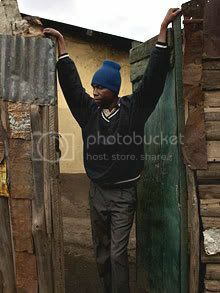 So why aren't the networks covering the fact that Barack Obama's half-brother George lives in a 6 by 10 foot hut in the slums of Kenya? It took a reporter for the Italian edition of Vanity Fair to locate George Obama. Obama noted that when he met his famous half-brother in 2006 “we spoke for just a few minutes. It was like meeting a complete stranger.” George Obama also told the magazine that “I live here on less than a dollar month,” and “if anyone says something about my surname, I say we are not related. I am ashamed.” Obama has done absolutely nothing to help his unfortunate half-brother. Obama may not want to help his 26 year old half-brother, but that doesn't mean we shouldn't. I'm starting the George Obama Compassion Fund which has the goal of raising some money to help George Obama move out of his one-room hut. George also wants to become a mechanic and surely he could use some funds to get the training he needs to fulfill his humble aspirations. Currently George lives on a few dollars a month. Even a few thousand dollars would completely transform this man's life.